Sotheby's International Realty Launches New Website! We are pleased to announce the launch of the newly redesigned Sotheby's International Realty SIR.COM, which was built to showcase the network’s listings in an immersive and visual way that is unique to the industry. The design changes include an increased focus on full-screen, high-definition video throughout the site, from the homepage to property detail pages, to allow for a more immersive consumer experience. High-resolution photography also plays a more prominent role. The property detail pages feature: slideshows that tell a home’s story via the captions, custom video, location overviews that provide insight into the local area via video and text, and a seller or expert quote that offers a personal view of the property. Consumers still can search for a home based on lifestyle and amenity but now have the ability to sort their results by various home features including pools, kitchens and views, and compare visual images of that feature among their search results. Atlantic Bay Sotheby’s International Realty in Provincetown, MA, offers exclusive Sotheby’s International Realty marketing, advertising and referral services designed to attract well-qualified buyers to the firm’s property listings. In addition, the firm and its clients benefit from an association with the Sotheby’s auction house, which promotes real estate referral opportunities with auction house clientele. As a Sotheby’s International Realty affiliate, the firm also has the unique ability to refer its real estate clientele to the auction house for jewelry, art, unique furniture and collectible appraisal services. Property listings from Atlantic Bay Sotheby’s International Realty also are marketed on the sothebysrealty.com global website, as well as on the firm’s local website, www.atlanticbaysir.com. Atlantic Bay Sotheby’s International Realty is located at 168 Commercial Street, Provincetown. For additional information, please contact 508-498-2430. The Sotheby’s International Realty network currently has more than 16,500 sales associates located in approximately 760 offices in 60 countries and territories worldwide. Each office is independently owned and operated. Once again, we proudly distinguish ourselves from our competition by offering our seller clients a new website for marketing their waterfront property to an international audience of the world's most qualified buyers. 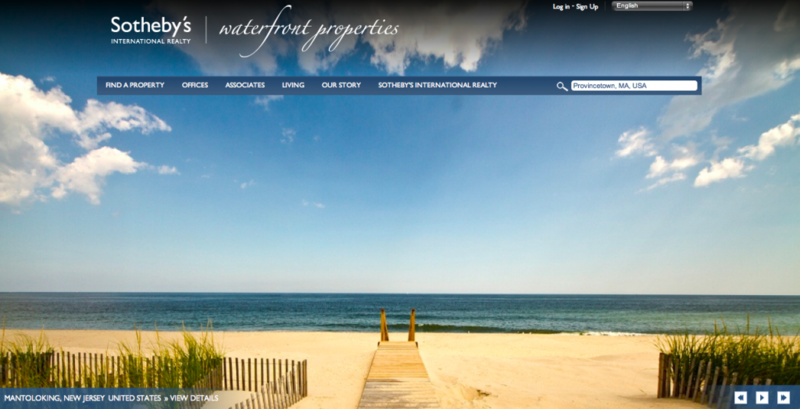 Sotheby's International Realty Affiliates LLC announced the launch last week of a Waterfront specialty market website, the second in a planned series of branded websites for specialty markets. The specialized website, which can be found at waterfrontpropertysir.com, matches the look and feel of the brand's website, sothebysrealty.com, and provides detailed Waterfront lifestyle and listing information and resources. The website enables buyers and sellers to search for the finest properties in this segment and the sales professionals who represent them. It covers a full spectrum of lifestyle types and properties including: ocean and beach, riverfront, lakefront, island and boating. This site was launched with more than $13 billion of waterfront property listings worldwide. The website will also highlight notable sales in this segment. "The Waterfront segment offers some of the most striking photography, making it a natural choice for a specialty market website," said Wendy Purvey, chief marketing officer, Sotheby's International Realty Affiliates LLC. "Waterfront is far and away the most searched lifestyle on sothebysrealty.com, so there is a great consumer fascination with this market. We will continue to enhance this specialty market website by adding custom content on waterfront living based on the body of water. For example, the site will convey what it is like living on an island in the Bahamas versus living on a lakefront in Italy or Minnesota." In addition to searching for waterfront properties on this new site, our buyers can easily search for property on the outer Cape through our website, atlanticbaysir.com. You'll find one-click links that will quickly do the searching for you, for example Provincetown Single Family homes, Provincetown Condos, Truro Single Family homes, B&B's and Inns for sale and many others. The Sotheby's International Realty network currently has more than 12,000 sales associates located in approximately 625 offices in 44 countries and territories worldwide. Founded in 1976 to provide independent brokerages with a powerful marketing and referral program for luxury listings, the Sotheby's International Realty network was designed to connect the finest independent real estate companies to the most prestigious clientele in the world. In February 2004, Realogy Corporation, a global provider of real estate and relocation services, entered into a long-term strategic alliance with Sotheby's, the operator of the auction house. The agreement provided for the licensing of the Sotheby's International Realty name and the development of a full franchise system by Realogy's subsidiary, Sotheby's International Realty Affiliates LLC. Affiliations in the system are granted only to brokerages and individuals meeting strict qualifications. Sotheby's International Realty Affiliates LLC supports its affiliates with a host of operational, marketing, recruiting, educational and business development resources. Franchise affiliates also benefit from an association with the venerable Sotheby's auction house, established in 1744. "The Cape," as most people know it in New England, is Cape Cod -- home of the Kennedys and playground of the rich and famous. However, there is another Cape. And that one offers waterfront views to rival Cape Cod's. Cape Ann is located on the North Shore of Boston. It has been the base for many artists and writers throughout the years who've come to be inspired by the ocean views, the colonial era buildings and the majestic boats. The communities on this Cape include Gloucester, Rockport, Essex and Manchester. Surrounding towns also provide equally stunning views, like Ipswich, Marblehead, Beverly and Newburyport. Both Cape Cod and Cape Ann provide the luxury lifestyle within charming and historic New England fishing villages. Atlantic Bay Sotheby's International Realty has been sharing wonderful photos of Cape Cod. We wanted to share some of our favorite views from our homes the other Cape. Visit the By the Sea Sotheby's International Realty site to see more North Shore real estate.